A screen grab from the viral video (watch below). 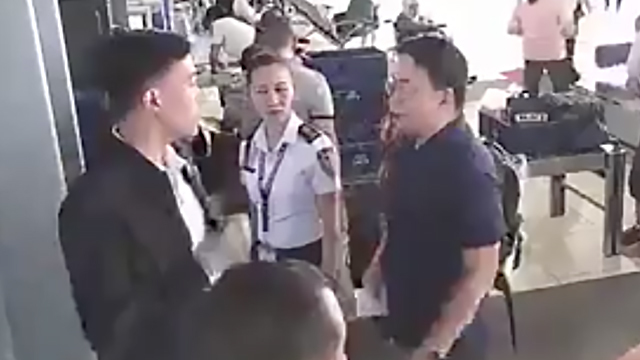 A Philippine lawmaker has been caught on camera apparently refusing to comply with airport security and bullying security staff. Footage of Congressman John Bertiz at the Ninoy Aquino International Airport (NAIA) has gone viral, with one version getting more than 200,000 views as of today (Sunday, September 30). Bertiz has hit back today, saying that he was confronting the security officer because he saw “Chinese looking” passengers failing to pass through the security checkpoint. However, the Congressman has neither confirmed nor denied whether he took off his shoes as required at the airport. The Department of Transportation has today vowed to investigate the incident. In the soundless video, Bertiz passes through a metal detector at the airport when a male security checker appears to tell him to remove his shoes. Other passengers in the video can be seen carrying their shoes when they pass through the metal detector. Bertiz then flashes what looks like an identification card to the security checker, who then turns his head and backs away from the lawmaker. Bertiz goes near the security checker and grabs the officer’s jacket, seemingly trying to get hold of his ID. The officer appears to initially refuse to give his ID to Bertiz, who then snatches his ID off his jacket. Bertiz then walks out of shot, while the officer walks to the opposite direction. The lawmaker has said the incident happened on Saturday morning, when he was about to fly to Cebu. He said there were supposedly Chinese passengers escorted by NAIA staff who did not pass through the security checkpoint. Bertiz said this was the reason why he confronted the security officer. ALSO READ: Lawmaker accuses Philippine government of employing "internet trolls"
The CCTV footage, however, does not capture any such passengers. Bertiz believes the security checker supposedly called him out so that he will not be able to go after the Chinese passengers and their NAIA staff escorts. The congressman is only being a humble servant. He humbly serves President Duterte by imitating his constant bullying behavior. The President also is only being a humble servant. He humbly serves Chinese President Xi Jinping by imitating his constant bullying behavior.